Runner's World magazine is the largest running publication in the world. Every issue is read by 2.4 million readers. Runners World provides runners of all levels with up-to-date information on training, nutrition, injury prevention, sports psychology, and total fitness. It also reports on premier running events, runners profiles, and running gear reviews. The Double Road Race was featured in a recent issue. NBC Bay Area in San Jose California interviewed Bob Andreson before the Pleasanton Double event. Get the lastest bay Area news, weather, traffic, entertainment and health. Get local Bay Area new, breaking news, and national news from NBC Bay Area. California Track & Running News is the official magazine of all four USATF associations in California and northern Nevada. It is the only magazine in California that covers distance running, track & field, ultra running, cross country and road racing in each issue. 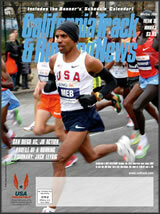 The Double Road Race is being featured in the summer (2013) issue of California Track & Running News. The Double Road Race® debuts as a new sport and a new challenge for runners. As a group, distance runners are a brainy lot with above average intelligence – that’s not just one man’s opinion, surveys have proved it! The Huffington Post was founded in 2005. It has an active community, with over one million comments made on the site each month. As a sports psychologist and top endurance athlete, I want to stay healthy and fit, just like you. And I'm always interested in a new challenge. Whether you're a runner, triathlete, cyclist, or a multi-sport athlete, if you're like me, you'd like to create more variety in your workouts and competitions so that you can stay motivated to keep going, right?